Thank goodness Louise’s work is back at Cayuse! 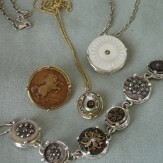 A favorite gift among our clients is a unique piece of sterling or gold jewelry highlighting vintage and antique buttons. These one-of-a-kind showstoppers can be made from early hand carved shell buttons, industrial age gilt buttons, work buttons from uniforms and dungarees, and even old sterling, brass or glass bridle rosettes. Many of the buttons have a rustic, western, or equine theme, while some of the work is strikingly elegant. Holiday bites and our famous huckleberry – champagne cocktail will enhance the festive atmosphere. For the traditionalists, our hot spiced wine will make its winter debut on the woodstove.